…And we couldn’t be more thrilled to share it with all of you! With more than 1500 hours of work under our belts – some very late nights, and early mornings – we truly can’t wait to hear what you think. Head over to http://useassembly.com and you can sign up for a free 30 day trial or just learn more about all the cool stuff we are doing to help manage Influencer campaigns. 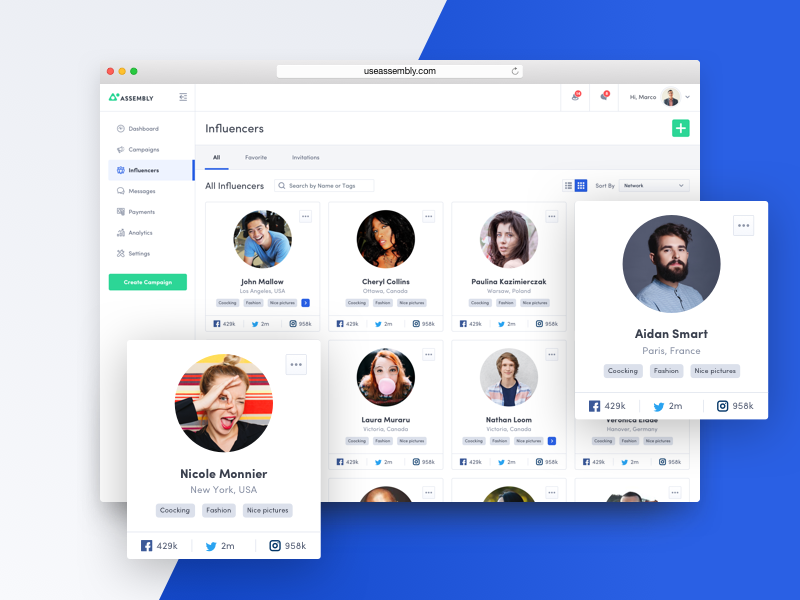 This view is showing how we display influencers in the company dashboard. It’s an easy way to view high level stats and info about an influencer before they are invited into a campaign. My favourite part? Your company has the ability to ‘favourite’ influencers and double check the status of any invitations that have been sent out. Pretty cool, eh? !